The YTR-300ADS has been designed by the same team that produces our top of the line professional models and shares many of the same qualities, like a rich full tone with accurate intonation, and the ability to either blend with the ensemble or project a solo. It features monel alloy pistons for quick and reliable valve action, a yellow brass bell for a clear, resonant tone and a reverse main tuning slide for smooth resistance and airflow. The entire inner bore taper from mouthpiece receiver to the bell has been scientifically designed for beautiful tone color, comfortable response, and as much sound as you want. This durable bell is laser fused using a pluzuma welding system which results in a seamless finish allowing for even, consistent vibrations. the yellow brass material helps this bell achieve increased projection, response and a clear resonant tone at all volume levels throughout the range of the instrument. 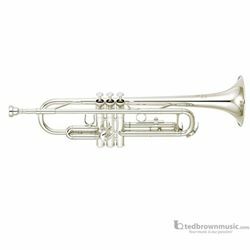 The YTR-300ADS features monel alloy pistons which are resistant to corrosion and are an ideal choice for professional trumpet pistons which must retain precise fit and smooth action over many years. The reverse main tuning slide offers smooth resistance and airflow for easy, comfortable playability and harmonically rich tone. Hand lapping pistons and slides ensures an absolutely perfect fit and seal between the pistons and casing or slide parts. Such a perfect fit helps to achieve smooth air flow and smooth action and improve the response and intonation of the instrument.